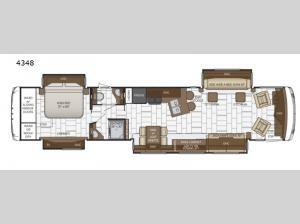 Get ready to tour the country or camp at the base of a mountain in this class A 4348 quad slide out Ventana motor home by Newmar! In the evening come relax at the 87" hide-a-bed sofa with two ottomans or at the 74" jack knife sofa while watching TV. Your grandkids will enjoy eating breakfast at the counter while sitting on the bar stools while mom and dad and the grandparents can dine at the hide-a-leaf dinette. The rear bedroom has a king bed plus plenty of storage with a dresser, nightstands, and a wardrobe with sliding mirror doors. The corner of the bedroom has been prepped for an optional washer and dryer which makes it easier than ever to keep up with your laundry while you are away from home. Wherever your travels take you, you will want this luxurious model! This model is available with a Spartan chassis.